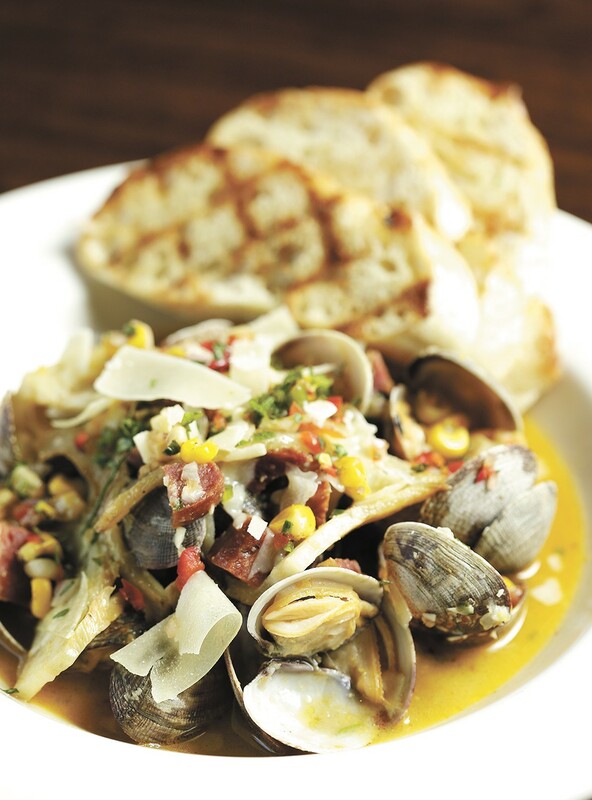 The Steamed Clams from Downriver Grill. As an Inland Northwest resident for two years, I don't have the personal connections to some local restaurants that locals might — no childhood favorites or places my family spent memorable meals. But I do have a sense of the exciting growth of our dining scene since I moved to Spokane, and for the couple of years I spent visiting the area before heading this way to live with my significant other after doing the long-distance-relationship thing. Consequently, every restaurant I love here is still a "new discovery" and most of the time inextricably linked to happy meals with my partner. The diminutive Bon Bon bar inside the Garland Theater was the first place I had a cocktail in Spokane, well before I learned it was one of the first spots in town to embrace the so-called "craft cocktail" craze. It's since become my favorite go-to for a cocktail thanks to its friendly vibe, proximity to my house and killer Happy Hour deals. The Bon Bon bartenders certainly know their way around a wide array of mixology options, but I like to keep it simple. Often that means bourbon on the rocks — a Bulleit Rye or maybe High West from my home state if I'm feeling flush — but it's hard to resist the mix of bourbon, sugar and bitters in the house Old Fashioned, which might be the only Happy Hour option that never drops off the menu. It's a sweet treat that goes down dangerously easy. Steamed clams are common on appetizer menus, and it's pretty hard to screw them up. At the same time, it's hard to find steamed clams so memorable they demand a return trip on their own. But Downriver Grill has figured it out. Start with the clams — you get plenty of the meaty little guys, and you don't get a lot of empty shells or clams that refused to open in the batch. Add in hearty chunks of flavorful Spanish chorizo sausage; I've had chorizo in steamed clams elsewhere, but it's typically just a hint of it, and it's crumbled ground chorizo rather than pieces you can really sink your teeth into. Then there's the corn relish, adding a sweet counterpoint to that salty, spicy sausage. Finally, the Parmesan broth in the bowl demands slurping with either empty clamshells or the crusty Italian bread that comes with the dish. Some restaurants become favorites because of their boundary-pushing cuisine, others for their consistent excellence. From my first visit for a date-night dinner through many return trips, Italia Trattoria has always delivered both, to the point that I know whatever I order will not disappoint. And while I can certainly recommend the Pappardelle Lamb Ragu or the Sausage and Pistachio Stuffed Quail, my go-to is this dish blending a nice array of chili-spiced shrimp and calamari swimming in a tomato-based sauce alongside slices of fresh jalapeño, basil leaves and chunks of garlic, topped by a black mass of fresh pasta colored by the slightly salty squid ink. You won't find this treat in the old-school, red-sauce Italian joints, and enjoyed with a glass of wine and the always-stellar service, it makes a trip to Browne's Addition feel utterly luxurious.